We're going to experiment this winter and beyond with some drop-in workshops on Wednesday afternoons. You may be aware of our Teen Animanga Club, which has been running monthly for many years now, and we're trying to see if there might be some interest in starting a new club or two. 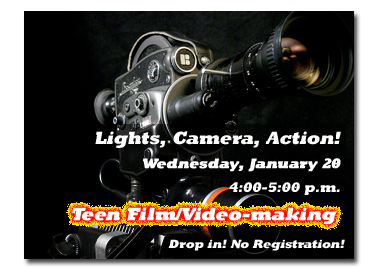 Some of our teens have expressed an interest in clubs featuring writing, cartooning, gaming, film-making, or tech. We thought we'd experiment a little and see what sticks. 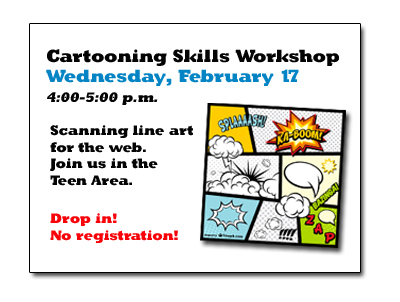 So, if you're a teen writer, artist, gamer, techie, or just want to hang out, we hope you'll try out some of these workshops as we go along, and let us know what you think!